The Quaker Oats Company, a subsidiary of PepsiCo, Inc., recently announced a voluntary recall of a small quantity of Cap’n Crunch’s Peanut Butter Crunch cereal due to the potential presence of Salmonella. While the potentially affected product only reached five specific Target stores and is limited to 21 boxes of one variety with two Best Before Dates, Quaker is initiating the voluntary recall to protect public health. The recall was initiated as the result of a routine sampling program by the company, which revealed the finished product may contain bacteria. Salmonella is an organism that can cause serious and sometimes fatal infections in young children, frail or elderly people, and others with weakened immune systems. Healthy persons infected with Salmonella often experience fever, diarrhea (which may be bloody), nausea, vomiting and abdominal pain. In rare circumstances, infection with Salmonella can result in the organism getting into the bloodstream and producing more severe illnesses such as arterial infections (i.e., infected aneurysms), endocarditis and arthritis. 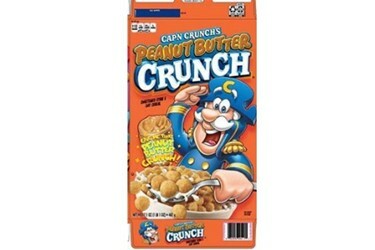 A picture of the product listed above and information about how to identify the recalled products can be found on www.capncrunch.com and is provided below. There are no other Quaker products being recalled. The company is working closely with the Food and Drug Administration (FDA) to further investigate this issue and ensure the recalled products are removed from store shelves and are no longer distributed. In the meantime, the company is taking these actions out of commitment to and concern for consumers. No illnesses related to Salmonella have been confirmed to date. Consumers who have purchased the above products are advised not to consume them, and urged to dispose of or return them to the place of purchase for a full refund. They can direct any questions to 800-234-6281, Monday – Friday, 8:30 a.m. – 5:00 p.m. (EST). For more information, visit cu.pepsico.com/capncrunch.